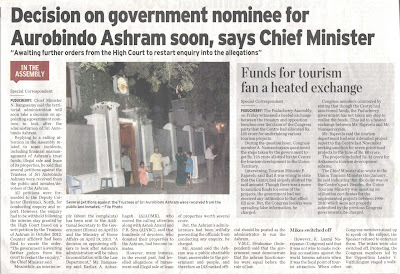 Chief Minister N. Rangasamy said the territorial administration will soon take a decision on the need for appointing a government nominee to look after the administration of Sri Aurobindo Ashram. Replying to a calling attention in the Assembly related to some incidents, including financial mismanagement of Ashram’s trust funds, illegal sale and lease of its properties, he said that several petitions against the Trustees of Sri Aurobindo Ashram were received from the public and inmates/devotees of the Ashram. All petitions were forwarded to the Deputy Collector (Revenue), North, for conducting enquiry and report. However, the enquiry had to be withheld following the interim stay granted by the High Court based on a writ petition by the Trustees of Ashram in October 2012. Counter affidavit had been filed to vacate the order. “The government is awaiting further orders from the court to restart the enquiry,” the Chief Minister said. Meanwhile, an interim reply (about the complaints) has been sent to the Additional Secretary to the Government (Home) on April 16 and the Ministry of Home Affairs on April 19, 2013. “A decision on appointing officers to look after Ashram’s administration will be taken in consultation with the Law Department,” Mr. Rangasamy said. Earlier, A. Anbazhagan (AIADMK), who moved the calling attention along with Ashok Anand and P.R. Siva (AINRC), said that hundreds of devotees, who donated their properties to the Ashram, had become inmates. However, many inmates, in the recent past, had levelled allegations of harassment and illegal sale or lease of properties worth several crores. But, the Ashram’s administrators had been wilfully preventing the officials from conducting any enquiry, he charged. Mr. Anand said the Ashram was a public charitable trust, answerable to the government and people, and therefore an IAS ranked official should be posted as the administrator to run the Ashram. V.M.C. Sivakumar (Independent) said that the government must demonstrate that the ashram functionaries were equal before the rule of law. However, K. Laxmi Narayanan (Congress) said that it was not wise to make reckless accusations against the world famous ashram when it was the focal point of tourist attraction. When other Congress members stood up to speak on the subject, the Speaker refused to entertain them. The mikes were also switched off. Protesting, the Congress members led by the Opposition Leader V. Vaithilingam staged a walkout. Filio: In response to our exchange posted on your website I’m now sending you my answer. Once again, I frame my response in two parts. Part 1 is a preamble. Part 2 is my specific response. I hope that as our exchange gets more focused, with your cooperation, as we go ahead I will not need preambles in my subsequent messages. In my response to you dated 11th July I had expressed the need and importance to focus our discussion on facts. But you don’t appear to be able or too keen to stay focused on facts and I find that you are instead eager to shift the discussion to the realm of opinions. But I know that you can turn around and accuse me of having aired my opinions and say that your opinions were in response to mine. Fine, so be it for now. To avoid exchange of more personal opinions I will for the time being refrain from expressing more opinions. Instead, I propose to redirect the focus on those facts on which meaningful opinions could be based if need be, at a later stage. Because according to my observations, and I suppose that everybody would also be able to make the same observations, opinions have some, larger value if they help bring about clarity or a better understanding, which can be achieved most effectively if they are based on facts. On the other hand opinions that are based on personal preferences do not necessarily bring about clarity as their primary purpose is to express or fulfill a personal preference, which is some cases might be a preference of creating confusion and misunderstanding. Sridharan: Your focus seems to be so much on the Preamble that you seem to be writing the Code of Blog Procedure as opposed to the Code of Civil Procedure! But let not the rules of discussion take more space than the discussion itself! By the way, the language here is too decent for the crocodile trainer Filio (I heard he spent some time in the Crocodile Farm near Chennai). Frankly, I have nothing against training crocodiles except that it has subconsciously transmitted to Filio the bad habit of dangerously snapping the jaws at the opponent before even the conversation begins. Also the awesome references to below the belt are conspicuously missing here. He would not even have the patience to read this long preamble, leave alone writing it. The above text seems to be written by no other than our good old Mama Shakuni, Matriprasad. So be it. What does it matter if Matriprasad disguises himself as Filio or the reverse? Citing several complaints of alleged misdeeds in Sri Aurobindo Ashram, ruling AINRC MLA Ashok Anand has petitioned the Lieutnant Governor Virendra Kataria urging him to take action to bring the ashram under the purview of the Right to Information Act. In a memorandum to the Lieutnant Governor on Saturday, Anand said that since Sri Aurobindo Ashram Trust is a charitable organisation receiving huge donations from devotees, the trust and all its operations should be brought under the RTI Act. Further, he sought to bring the ashram under the control of an IAS officer in a similar way like the Auroville Foundation through a legislation. There are around 1500 inmates in the ashram who would feel secure if there is an IAS officer whom they could approach with their grievances, he added. The ashram has been a beacon for spiritual seekers from all over the world, but there have been charges against the trustees of the Sri Aurobindo Ashram Trust, he claimed. The issue has been raised in the Territorial Assembly also. Based on the complaints by a section of ashram inmates, the government had instituted a probe in September 2012 under the District Collector. A team of senior officials took oral depositions of the women inmates. However, the ashram moved the Madras High court against the government and obtained an ex-parte stay on the government probe in October 2012. Anand alleged that the trustees are destroying evidence on the allegations made. If the trustees had nothing to hide and the allegations were baseless, they would have cooperated with the probe, he added. The MLA said that he would meet leaders of all political parties for bringing in transparency in the functioning of ashram.